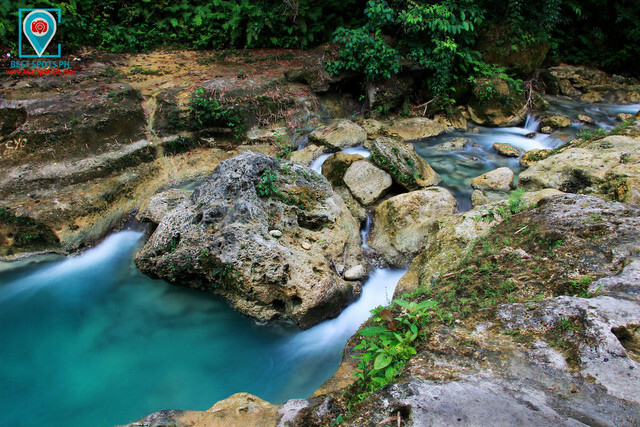 As I prepared to set out in hopes and excitement of seeing the famous waterfall-like river that nestled in this area before daylight fades, the earthly scent produced after the rain caught my senses as we finally reached the ground to the Canlaob Falls; an approximately 10-minute ride from Sta. Filomena. For an instant, the only scent i could smell was the peculiar characteristic smell of earthly soil, and yet sweet like grass and luscious fauna that spreads in mid-air. The astonishing formation of the bedrocks created from the watercourse from the river system of Canlaob. I searched the landscape and I felt the tingle in the back of my neck as the wind rushed throughout the unfamiliar terrain. Then, a sense of wonderment came to my mind. While the trail going to the Canlaob Falls is fairly easy, getting downward is somehow a bit challenging because of the unpredictable weather. The rain made it harder for us to descend in 45 degrees as it made the 50-60 meters pathway more slippery, and another walk at about 60 meters or so before reaching the site. The eventide is close to an hour and a half as we reached Canlaob Falls and finally the last raindrop spattered against the ground. Nodding in the direction of the falling water, i was delighted and somehow touched by its existence. 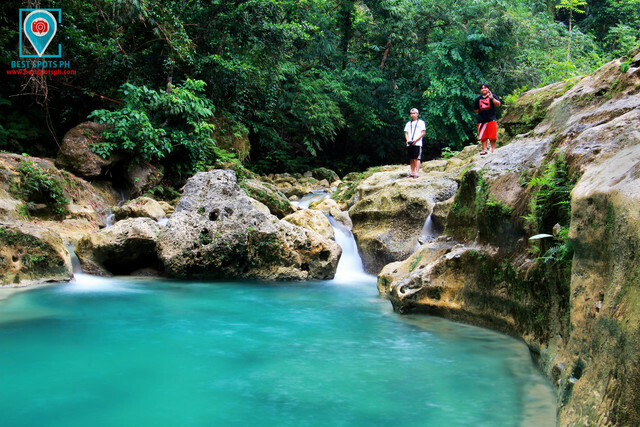 Canlaob is a river system that is famous being the starting point for most canyoneering activities in South Cebu. 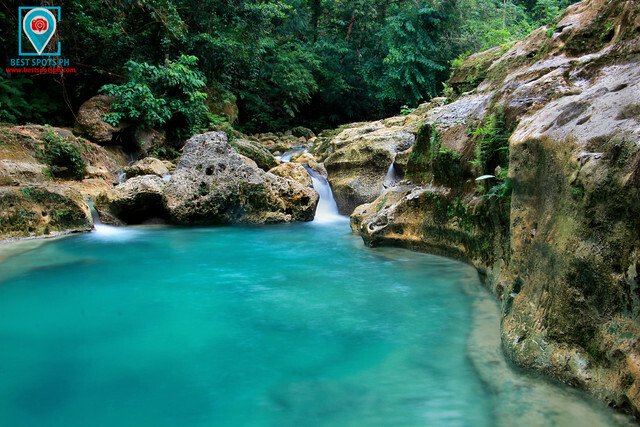 A few meters from the jump-off site lies the waterfall-like river recognized as the Canlaob Falls; it is situated in Barangay Sangi, Alegria, Cebu and about 15-minute ride from the town proper. Taking a photo souvenir with the Canlaob Falls as my background. 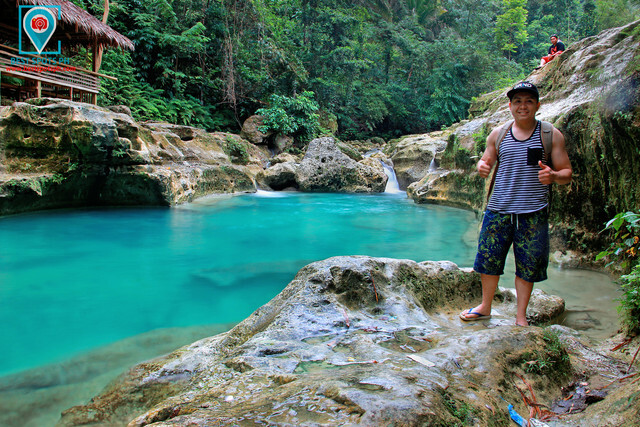 Canlaob Falls is one of the most convenient spots for chasing waterfalls in South Cebu and is known for its natural pool that came from the river that flows downstream. It is partly a cascading type of waterfall; the water descends a series of rock steps, and sometimes, if the rain is heavy upstream, it creates a powerful waterfall called a cascading. 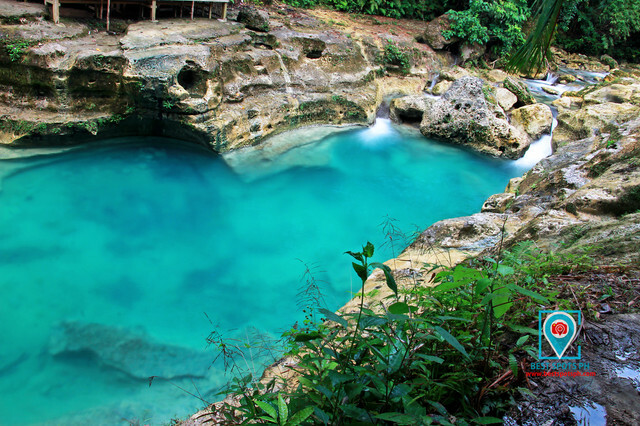 One remarkable feature of Canlaob Falls is its natural pool, or sometimes called as a lagoon. 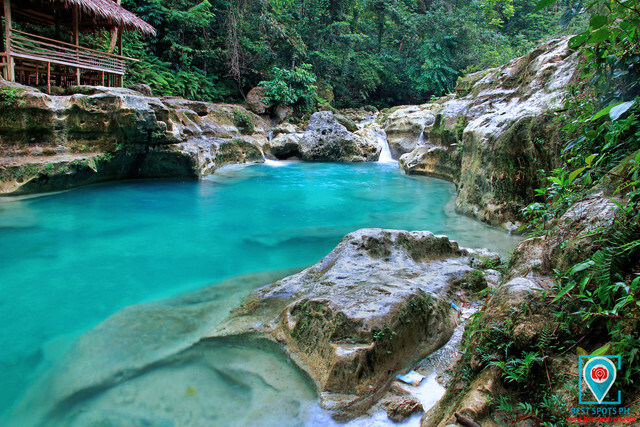 The resulting plunge pool that came from a channeled river is possessed with nature's enchantment; That is the tranquility of that bluish tint of cerulean toned toward cyan, and a combination of slightly greenish shade of cyan that gives an impressive hue to enjoy and experience while dipping its pool. Additionally, what something that caught me with astonishment is the formation of the bed rocks created by the watercourse within the plunging pool that resembles a tiered bed formation. It is somehow an impressive natural formation that has been created over the years. 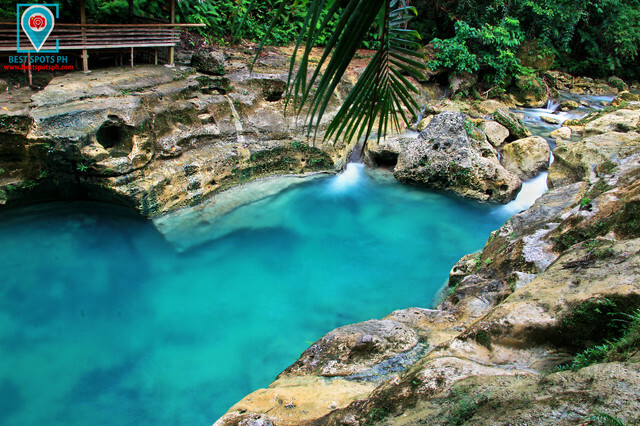 The plunging pool is said to be at 6-8 feet from the water level, and approximately, Canlaob Falls is around 5 feet high. Few minutes before nightfall rises, we decided to pack our things. 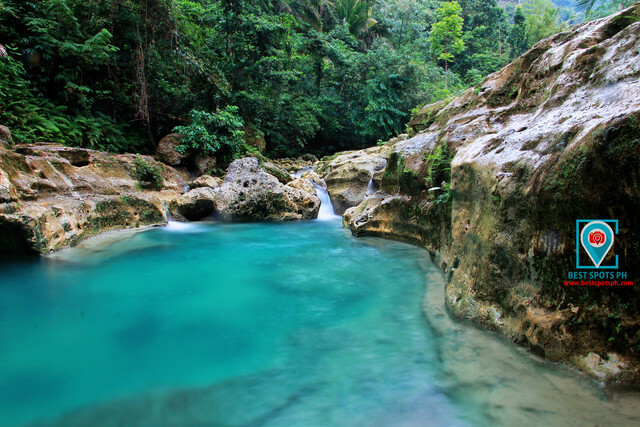 Somewhere in the middle of our trek, i looked back, my eyes and my mind both blinked and gently reminded me, "this is the day I first saw Canlaob Falls".